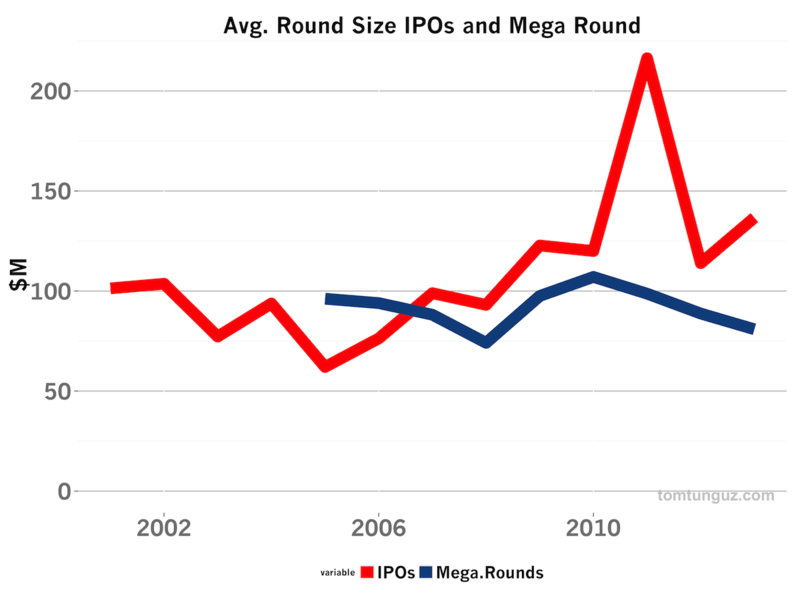 Let’s look at the trends over the past decade and across all IPOs and MegaRounds to get a better sense of the trends in the number of MegaRounds and IPOs, the total amount of capital raised by startups using each mechanism and the average round size over the past decade. This larger dataset should be more representative than the top 10. Note, I’m excluding Facebook’s IPO in 2012 as an outlier and I’ve adjusted for inflation. The chart above compares the total number of MegaRounds, those VC investments of $50M or more, from 2001 through 2013. In the past four years, MegaRounds have more than doubled in number from 20 to 40, and have increased every year. Last year, there was 1 MegaRound for every 2 IPOs. In 2012, there were 3 MegaRounds for every 4 IPOs. In short, MegaRounds are increasingly common, while the number of VC-backed IPOs is relatively constant. The trend is similar in the total amount of capital raised: MegaRounds are becoming more important in the ecosystem. But MegaRounds haven’t surpassed IPOs for total capital contribution. 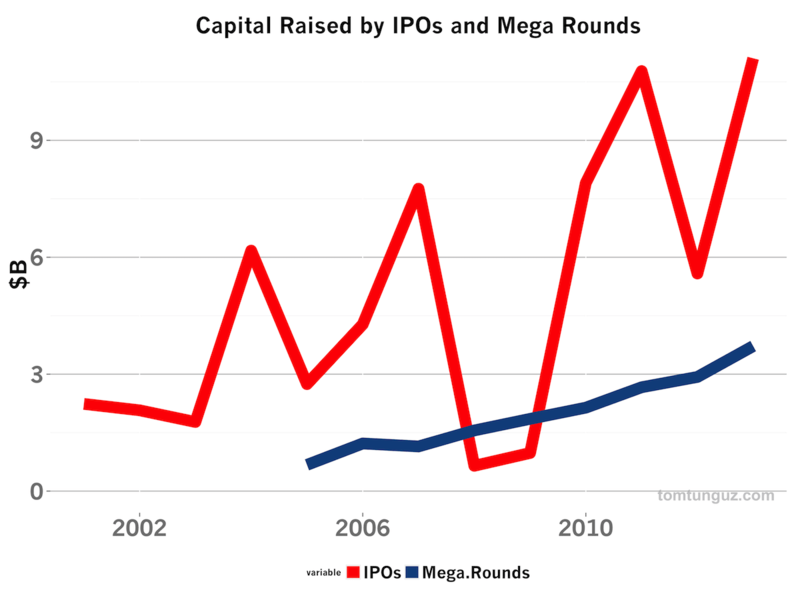 Over the last three years, in aggregate, startups have raised about 3x the capital in IPOs as from MegaRounds. The total number of dollars from MegaRounds is much more consistent than the relatively volatile public markets, and those dollars are growing at a 22% CAGR. Last, let’s contrast the average amount raised in a MegaRound and an IPO. In the last four years, the average MegaRound generates $94M in capital while the typical IPO raises $147M, a material 50% difference. This delta may be caused by many things. But I suspect the most important factor is startups who raise MegaRounds use these financings to delay IPO. 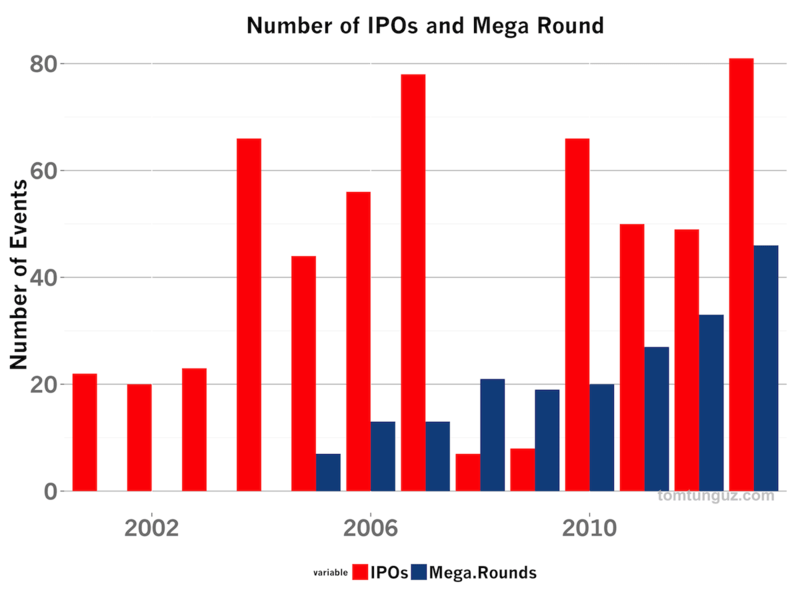 The MegaRounds of today are the same size as the IPOs of five or ten years ago. In some sense, they have replaced those IPOs. But MegaRounds haven’t cannibalized IPOs altogether. These MegaRounds typically aren’t providing the same type of liquidity to founders and investors as a true public offering, though many of them do have substantial secondary share sale components to founders and employees. Rather, they empower startups to remain private longer and continue to grow, which enables them to command higher valuations and raise more capital at IPO. The rise of MegaRounds as a new financing tool for founders is a terrific development for founders. 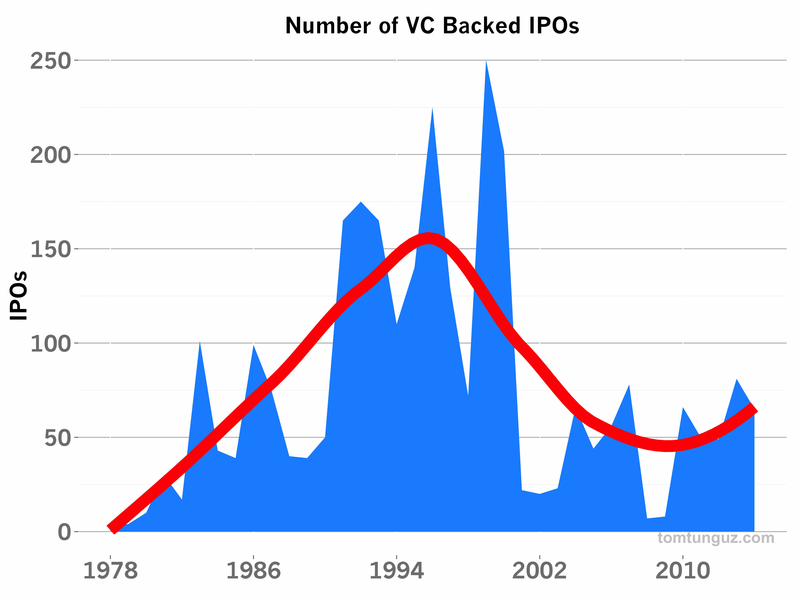 As the amount of capital entering venture capital has exploded, we can expect more and more of these MegaRounds and consequently, we should also see much larger IPOs than we have in the past ten years.